Dave Perry, Executive Bedding Editor for Furniture Today wrote a good article in their September 14th edition. It was titled “Lowball Labor Day Prices Suggest Sleep Is Cheap”, and in it Dave points out all of the screaming deals that were available over the holiday. This is not the first time Dave has written about this subject nor will it be his last because he has a good point. The question on the table is do we as an industry focus too much of our time and attention on the price of our products, versus the benefits they deliver? Here is what I know. When we as an industry focus our attention on price, the consumer does the same. Per Dave’s article we saw free box springs, $1.99 pillows, twin sets for $109, and just about every sale going announced 50-60% off. The expectation we set for the consumer is clear. We hook them on price and then leave it up to the retail sales associate to get them off of price and re-focused on what really matters. We put a lot on those rsa’s don’t you think? The easy solution here is to simply focus some larger percentage of our retail messaging on the great things our products can do for the consumer. 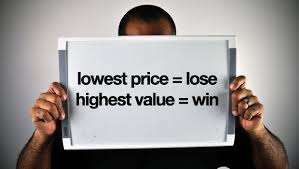 Stop beating people over the head with low price promises and instead, bring them in on value added offers. Communicate the emotional side of what we do like how sleeping better can improve their looks, help them lose weight, and provide them with a more positive attitude which can ultimately lead to all kinds of great things. How realistic is this? It’s simple for me to say “get a way from price advertising” because I have never owned a retail store, been in charge of marketing for a retail store, or even worked for a mattress retailer. We have to be careful not to hit the easy button on this issue. I’m not saying we shouldn’t push, but I am eager to learn more about this from the retail perspective so I am reaching out to you, the Q’s Views audience. What happens to retail traffic when you stray from the 50% off approach? What non-price theme works the best? Why is it that more retail ads don’t even offer a slight hint of the product benefits? Isn’t there room to do both? What are the real challenges with that approach? When I think about this logically I come to the conclusion that “benefit based selling” doesn’t really work in advertising. Then I hear about people like Jeff Giagnocavo who does great in his retail business and never mentions price. Normally I try to present a problem with some hint of a solution baked into the post. Not today. I want to hear from you so give it to us straight; what has to happen to get this industry focused on the things that really matter to the consumer? Other than price of course.